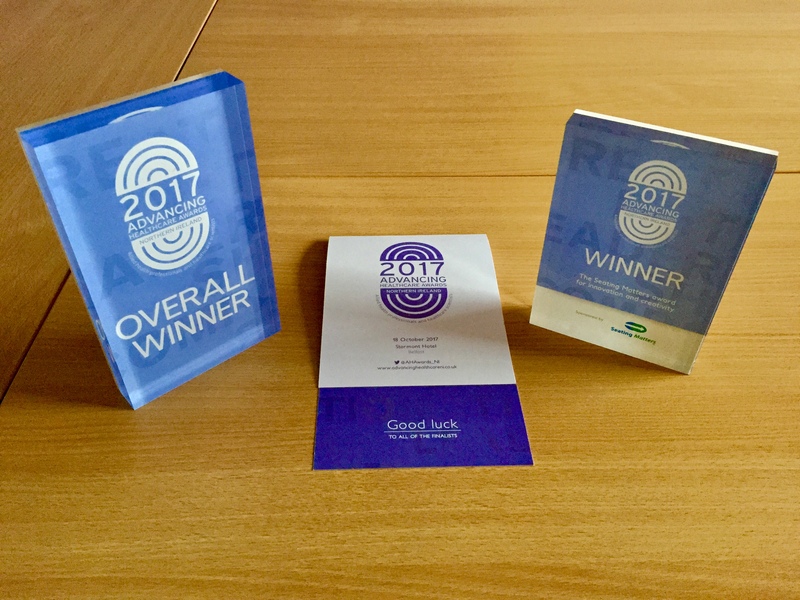 Ashton Community Trust together with the Belfast Health & Social Care Trust (BH&SCT) has won two amazing awards at a prestigious regional healthcare award ceremony. The Advancing Healthcare Awards NI aim to encourage innovation, team working, new ways of delivering care and the highest standards of practice. The ‘Overall Winner’ Award and ‘Innovation & Creativity’ Award recognised Ashton’s Bridge of Hope department for its pilot physiotherapy programme with people experiencing conflict-related pain delivered by BH&SCT musculoskeletal physiotherapist Francis McMonagle from the Trauma and Orthopaedic department. “All of us at Bridge of Hope and Ashton Community Trust are over the moon with these accolades as is Francis,” Irene Sherry Head of Victims & Mental Health Services at Ashton Community Trust said. Themes of this year’s awards were drawn from the Department of Health’s report ‘Health and Wellbeing 2026 – Delivering Together’, the outworking of Professor Raphael Bengoa’s Expert Panel’s recommendations. At the awards ceremony last night ( 18 October 2017) in the Stormont Hotel Bridge of Hope’s physiotherapy service scooped gold in The Seating Matters Award for Innovation and Creativity and also the impressive title of Overall Winner of this year’s Awards. The physiotherapy pilot was made possible with support by the Victims & Survivors Service (VSS) that administers funds on behalf of The Executive Office.